Of all the smaller displacement motorcycle sizes, 250cc motorcycles are one of the longest lasting and popular sizes. 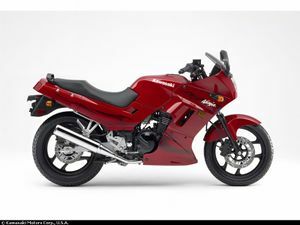 250cc motorcycles are especially popular with beginning riders. The range of 250cc motorcycles is one of the largest varying from entry level sportbikes such as the Kawasaki Ninja 250 to cruisers such as the Honda Rebel 250 and back to dirt oriented bikes such as the Yamaha XT250. With the demise of the 150-200cc class, the next step up in displacement from the 125cc class is now the 250cc class (15 cubic inches). Today a 250 is considered a "small" motorcycle, but they used to be considered "middleweights," which they truly are. Ideally, a 250cc class motorcycle is what the rider who has learned primary riding skills on a 125 should move up to. A "250" is a versatile machine, fairly powerful, moderate in weight, acceptably fast. If necessary, it can cruise on the freeway at 65 mph for reasonable periods of time. A 250 is not a touring bike, but if someone is adventurous enough they can be used for long trips. A person can get into a lot of trouble on a 250, but for the beginning rider of average size, strength, and confidence it can be an excellent trainer. A 250 is just about the ideal size commuter bike for any rider, regardless of experience, fast enough to stay out of trouble, and easy to handle and park. Anyone who does not need to go interstate speeds might find a 250 more enjoyable overall (especially if price factors into their satisfaction). The major American and European makers have not offered any street bikes in this class for a long time, but the Japanese have. In a sport bike category there is the Kawasaki Ninja 250. There are many of Honda Nighthawk 250 standard and CMX250C Rebel cruisers available on the used market. 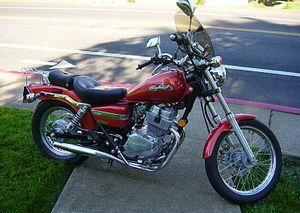 Suzuki is represented by the GZ250 cruiser. And from Yamaha came the sharp looking Virago 250 cruiser. All of these 250's have four-stroke motors, and all rely on conventional telescopic front forks and chain final drive. The average weight of these bikes is about 300 pounds. All are available in reasonable numbers and at reasonable prices on the used market. For the aspiring sport bike rider, the Kawasaki Ninja 250 is the obvious, and only, choice. It has a high revving, sophisticated, 248cc DOHC inline twin engine, and a six-speed transmission. The rear suspension is provided by a mono-shock. (All of the other 250's discussed here have conventional twin rear shocks.) It also comes with cast wheels, disc brakes front and rear, and a full sport fairing. The gas tank holds a whopping 4.8 gallons. The Ninja's dry weight is 304 pounds. It is the fastest and best handling of the modern 250's, with a top speed of approximately 100 mph. It is the only bike in this list that can reliably attain interstate speeds without vibrating itself apart. It's 29.3 inch seat height and sport bike ergonomics will be the main drawbacks for some riders. For the person who wants the versatility of a standard motorcycle, the Honda Nighthawk 250 is about the only choice. The Nighthawk is attractive and practical. Its 234cc sohc parallel-twin engine and 5-speed transmission gives it adequate performance. Its laced wheels and drum brakes front and rear should make it economical, but its list price was actually somewhat higher than the other 250's, $100 more than the Virago, and $400 more than the Ninja. The gas tank holds 4.3 gallons, enough to go a long way on a 250. The Nighthawk's seat height is the same as the Ninja's, and taller than the other 250's, at 29.3 inches. It weighs 287 pounds. 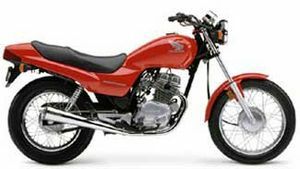 The best selling motorcycles today are cruisers, which explains why there are three cruisers in the 250cc class. The Honda Rebel was that company's entry. The same engine and transmission that powers the Nighthawk powers this mini cruiser. Strangely, the Rebel cruiser has a shorter wheelbase than the standard Nighthawk, but weighs in 19 pounds heavier (at 306). It gets a disc brake in front, which is a real improvement, and laced wheels. Fuel capacity is 2.6 gallons. The seat height is only 26.6 inches, and the center of gravity is lower than the Nighthawk's. The Suzuki GZ250's 249cc sohc single cylinder motor gave it a reported top speed of 76 mph; You should expect a little more horsepower from the Honda 234cc inline twins, and the Yamaha 249cc V-twin. But there is no denying that singles are fun. A disc in front and a drum in back provide braking, and the wheels are laced. The GZ250 cruiser weighs 301 pounds, and has a generous 3.7 gallon gas tank. Seat height is 27.8 inches. The Yamaha Virago 250 is one of the best looking of the 250 cruisers. The overall visual impression is of a true middleweight motorcycle. Its 60 degree sohc V-twin motor and five speed transmission provides adequate thrust, and a little more character than the Honda and Kawasaki inline twins. A V-twin usually has a lower center of gravity than does a vertical twin. The Yamaha came with laced wheels and a disc brake in front; like the other cruisers, it has a rear drum brake. The Virago's gas tank holds 2.5 gallons, and the bike weighs 301 pounds. The seat height is 27 inches. Pages in category "250cc displacement motorcycles"
This page was last edited on 9 June 2010, at 04:12.